In Edmonton, our backyard had some sparrows (what we referred to as “basic brown birds”) and the occasional robin. There were ducks and geese flying over, seagulls, pigeons and magpies. Pretty boring. Here, we are inundated with new and exciting birds! So many in fact that this is going to be a three-part post (for now). 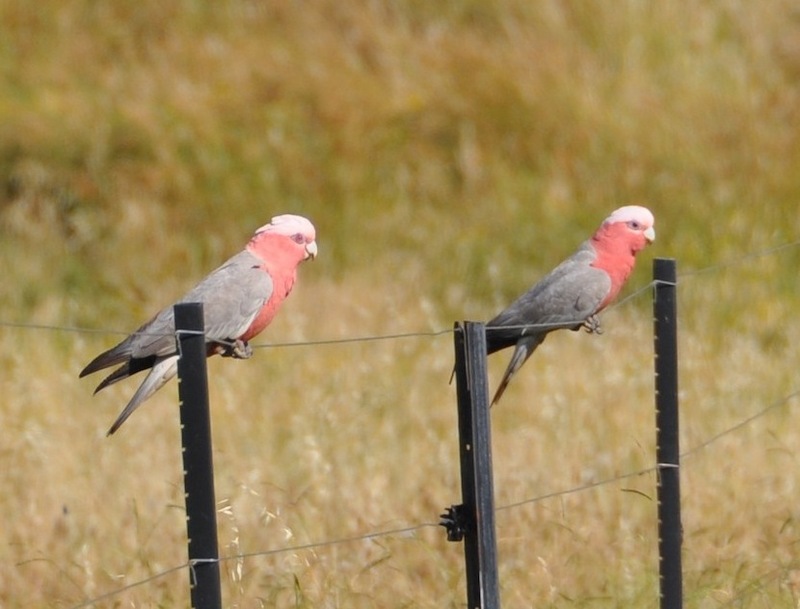 This first one is about ‘everyday birds’ – ones that seem to live year-round in the Riverina. We also found a great little web resource (called Birds in Backyards) where you can learn more about many of these cool Aussie birds; we’ve inserted a number of links here, so you can hear what we hear. Galahs are misunderstood here in Australia, but they have tried in their own way to be free. Galahs: One of the most common birds we see, they are a member of the cockatoo family, which is somewhere in the same family as parrots. They can be seen feeding on the ground all over the city, and might seem a bit ‘pigeon-y’ (even though the pigeons here are better than ones in North America…see below) but when you get out into the country, you realize how beautiful they are. Australians, for some reason, don’t like Galahs. Aussies think these birds are stupid; maybe they are, but there is a dumber bird we’ve found, as we will point out later. A rare picture of a lone cockatoo. There are usually a million of them and they are really fracking loud. Sulphur-crested Cockatoo: Equally common. These guys are big, and they are gorgeous. Australians probably take them for granted, but we love them. But, there is a down side to them. They are loud. Really loud. So loud, in fact, when we start house hunting, before we put in an offer we will go stand outside it early morning to make sure they don’t live around it. They make sleep impossible. We’ve seen these cockatoos doing some pretty interesting things though. One day while cycling, we saw a bunch of them land on a power line and then flip over and hang by their feet like bats. It was pretty cool. Then, even cooler, a few days later while driving through Bungendore, we saw them do that, then grab the line with their beak and hang by it. No idea why, but it was really interesting. Willie Wagtail: These little guys are really cute! They are defective members of the fantail family, we think. Fantails do as their name implies: fan out their tail. Wagtails do as their implies: wag their tail. We think they have some genetic problem that won’t let their tail fan out but they keep trying. We didn't take this picture of a magpie, but these birds are so abundant that no one would be able to say we violated copyright. But, this is a great picture so we will acknowledge it: Source: Barbara Hardy Institute http://www.unisa.edu.au/barbarahardy/ Photographer: John Hodgson. Magpies: These aren’t the same as the magpies in Edmonton, which were European magpies. 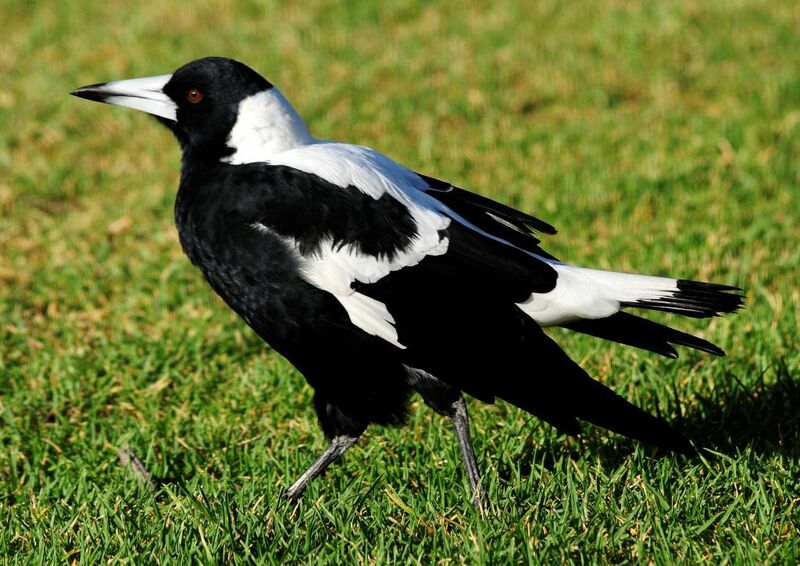 There are Australian Magpies (larger, mostly black with some white) and Magpie Larks (smaller with more white). The larks are pretty innocuous, but the Aussie magpies are vicious and a cyclist’s nightmare. We made it through this past nesting season without getting attacked, but by law of averages, within a few years Dan will probably have a big scar on his head or be missing a part of an ear from a magpie attack. When you hear an Australian Magpie, you wonder who in the neighbourhood just bought a theremin. Ducks: in an earlier post about things we thought we might miss in Canada, ducks were one of them. And we wondered if there were ducks in Australia. Yes, there are. Hundreds of millions of them! There have been a lot of news stories about them recently, about how the population is growing exponentially because of the end of the drought, about how they are devastating the rice crops in the Riverina (not a funny story, but you can’t not laugh at the fact that the farmer’s name is FOWLer), and how the Victorian government is allowing more hunting. 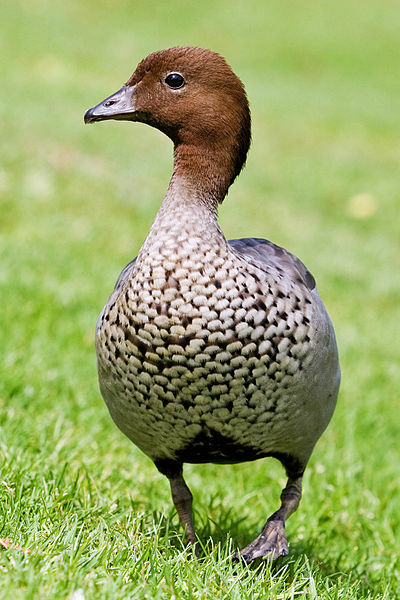 The common ones that we see are the Australian Wood Duck and the Pacific Black Duck. They are all over the place, and have chased us on the bike trail around Lake Albert even, when they thought we were going to run over their babies. Wading birds: we’ll lump both Egrets and Herons together here, partly because we are sometimes not 100% accurate on identifying them. We see more of these long-legged, long-necked beauties in one day than we saw in a life-time in Canada. 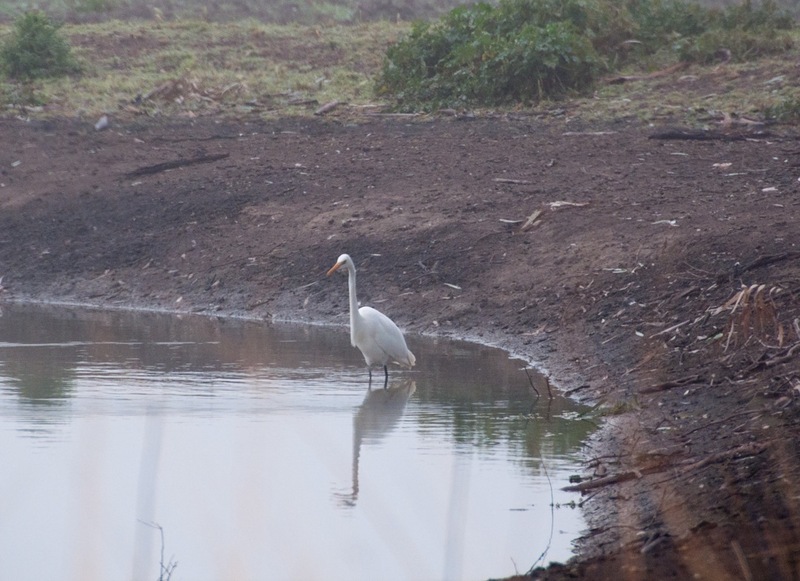 Little egrets and great egrets are pretty much the same except for size, and from a distance it is hard to judge: Is that bird, standing in a dam 100 metres away, 60 cm (little egret) or 80 cm (great egret) tall? Hmmm? There are also white faced herons and white necked herons. These ones are easier to tell apart. Pretty much every dam in the Riverina has its own egret or heron, as do most streams, and there are always some around the lakes. They seem to be pretty solitary, and probably territorial, as we never see them together. Ibis (Ibi? ): all over the place, huge prehistoric looking creatures with beaks that would go right through you. An introduced species, in 2008 the myna was voted as "the most important pest in Australia". Of course, mynas are mostly urban and any farmer who has lost lambs to a fox would argue with that designation. 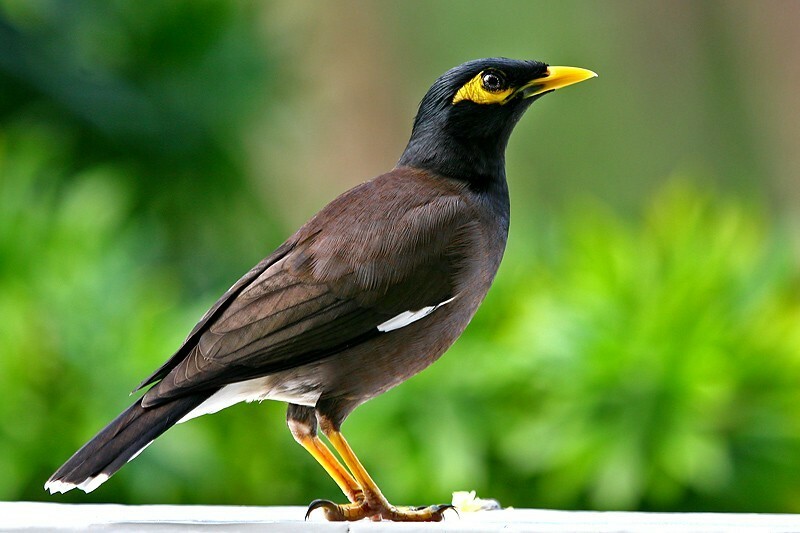 Common Myna: who knew where mynas lived? We didn’t. Or what they looked like. But we now know what they look like, and where they live. And it seems that most of them live in the bushes outside of Dan’s office. Crested Pigeon: actually kind of cute for a pigeon. The best thing about them is when they take off their wings make this really great squeaking sound like they need oiled. No room for a photo, but lmgtfy. Plovers/Masked Lapwings: It’s a plover. No it’s a lapwing. No, it’s a plover. There seems to be some discrepancy about this bird. One of our bird books calls this bird a Masked Lapwing; the other calls it a Masked Plover and says another name for it is Lapwing. The locals all call it a plover, though. We call it (Lisa edit: Dan calls it… not me; this is just rude!) the “16 year old bogan girl who didn’t know she was pregnant and has her baby in the Macca’s bathroom” (Macca being Oz slang for McDonald’s); this is the dumbest bird on the planet! 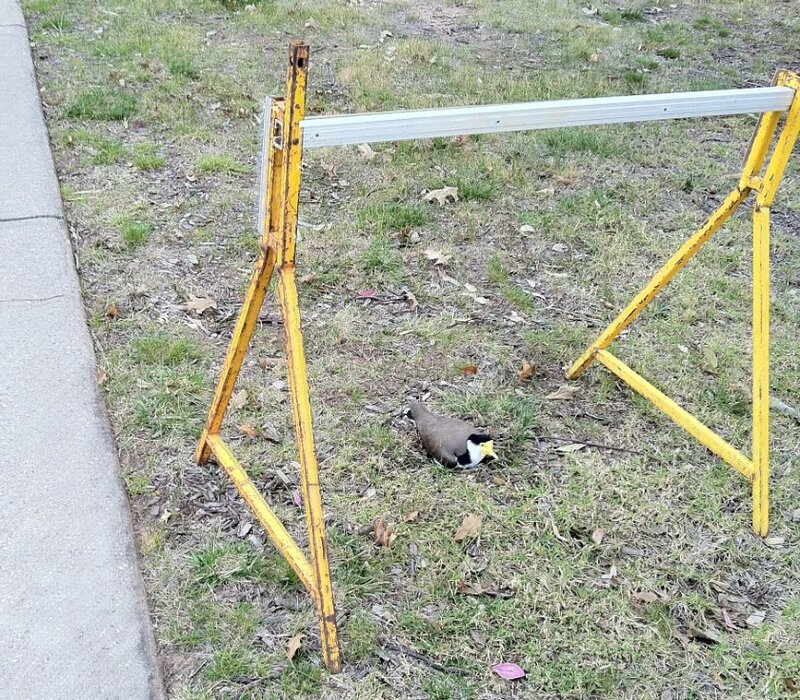 Like the bogan girl, plovers just ‘give birth’ wherever. Their ‘nest’ consists of wherever the female happened to be walking at the time the eggs just seem to fall out. Lawns, parking lots…whatever. You would think that they would plan ahead better, but no. Oops, my eggs fell out. I reckon I'll just have to sit here for a month. In the spring there were plover eggs all over the place. One laid her eggs about 1 metre from the intersection of 2 busy footpaths at CSU and facilities people had to put up a barrier to protect the eggs. But, they are good parents: both mom and dad violently defend the eggs; on campus, this became a spot to avoid for a month. Common Blackbird: OK, so not every bird in Australia is interesting. But we have a family of them in our backyard, so we like them a lot. You are probably all very frustrated now and wondering why we haven’t talked about parrots (since we mention them in almost every post). We do see parrots every day, but not always the same ones. Well, those will be coming up in the next entry, about what we call ‘migratory birds’ – or ones that seem to be seasonal and only stay for a short time. 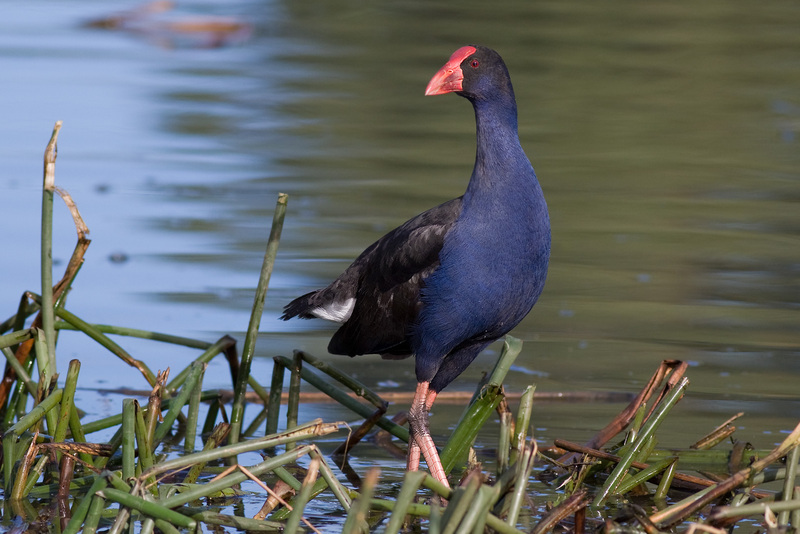 I'm a purple swamphen. Don't hate me because I'm beautiful. 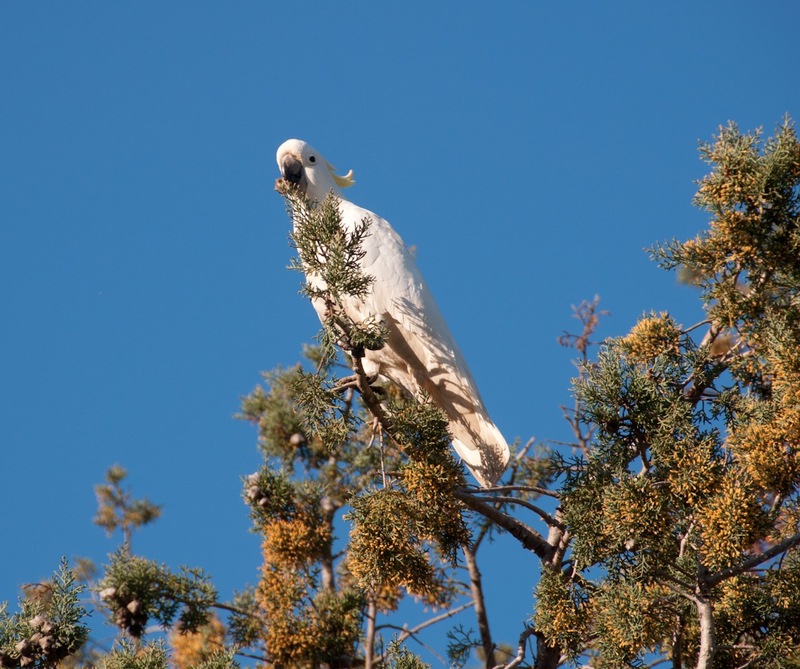 This entry was posted in Australia, birds, cockatoo, lake albert, magpie, Riverina, rural life, wagga, wagga wagga and tagged australia, birds, wildlife. Bookmark the permalink. When I was in Denmark there were these birds I saw everywhere that I thought were really cute, but the Danes viewed as pests… I can’t remember the Danish name, but when I asked what the name meant, a girl told me the closest she could think of is “damage birds” hehe! Everyone thinks their local birds are pests – when we moved to Alberta we thought the magpies were cool but all the Edmontonians hated them. They aren’t that cute, but I never had much of a problem with them. If you think magpies are noisy, try sleeping with a flock of cockatoos nearby. Loudest birds I’ve ever heard.